Encourage children to learn about the traditions and history of Passover with these educational worksheets. Kids will learn about the story of Passover, seders, and other traditions. 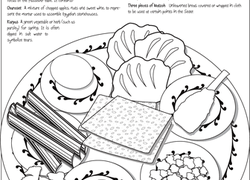 Read all about the story of passover with this coloring sheet, and colour in the pharaoh when you are finished! Help your child learn about the traditional Passover meal, the Seder. Help your child learn more about the Passover tradition of the afikomen, the last thing eaten at a Seder dinner for Passover.